It didn’t end in the way we wanted it to. Hell, it ended with every hockey fan’s worse nightmare. 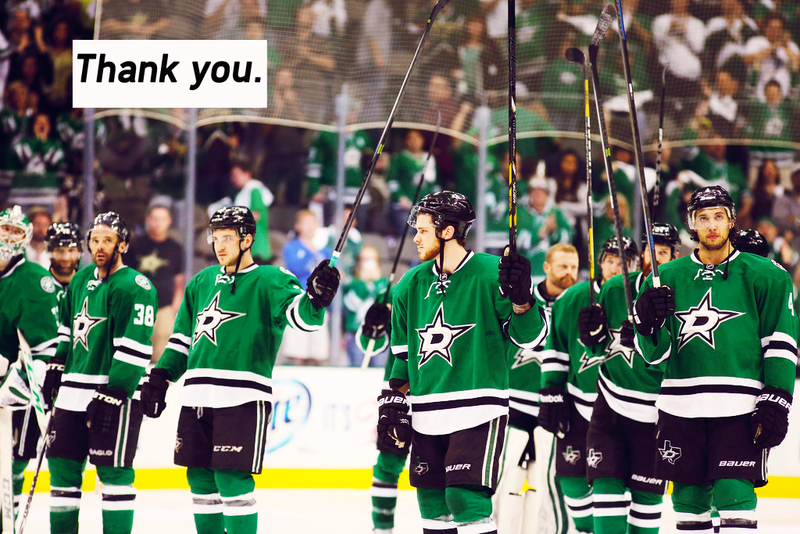 But that doesn’t change the progress the Stars made this season, and it doesn’t take away any of the greatness. It’s been a week since that Game 6, and I’ve had time to think about it and actually kind of get over it. I still haven’t been able to bring myself to watch the highlights, but it’ll happen in due time. The Stars played 6 more games than most people thought they would this season. I think that’s really important and nothing at all to be ashamed of. So many players got their first taste of the postseason and excelled (looking at you, Ryan Garbutt). Now that they have a bit of experience, the years to come should be incredible. Tyler Seguin is not a playoff choker. Unlucky, yes, but not a choker. I’m not really into fancy stats, but they all tell the same story: the Stars generated many, many more chances when Seguin was on the ice than when he wasn’t. He had some posts too, so maybe he just needs to aim better. Maybe it’s a good thing the Stars lost that series the way they did. It’ll keep ’em hungry. Although I do feel bad for Seguin. This is the third time in less than a year that he’s seen a game end like in that fashion, and two of those three times he was on the losing side. I just want to mention that it’s apparently a penalty when Ryan Garbutt and Gabe Landeskog snow shower a goalie, but it isn’t when Corey Perry doesn’t (even though Kari had to go clean his mask out because there was so much ice in it ahahaha). Some consistency would have been nice. The crowd at the American Airlines Center was wonderful. They were by far one of the loudest crowds I’ve heard all postseason. They deserved more playoff hockey in Dallas, but hopefully they’ll join us for the ride next year and pack the AAC night after night. Nothing will change how proud I am of this team. I’m so proud.